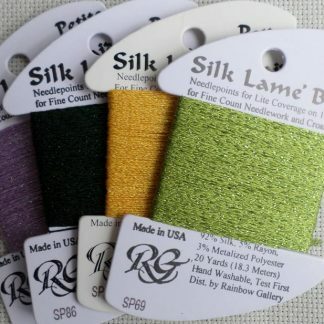 These Rainbow Gallery threads are Treasure Braid Petites made of 65% Rayon & 35% Metalized Polyester. 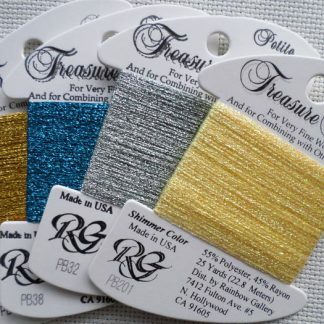 They are single strand braided metallics and are used for very fine work. 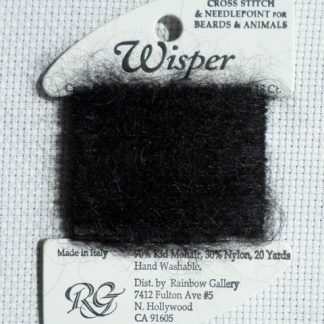 The thread is very durable and you can use it by itself, or where you would use two strands of blending filament. 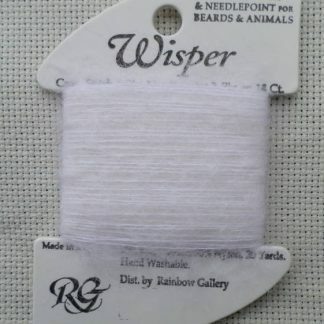 Great to use when you want to add a glimmer of metallic without overpowering the rest of your stitching. Suitable for embroidery or cross stitch. Note we do not carry all the colours but we can order them for you. Just send us an email via the Contact Us page and let us know what you are wanting.